Our story begins in the Dwarven city of Redstone. The streets hustle with all kinds of races, though the majority is Dwarvish. Many mine carts roll through the dirt streets, guards walking around slowly as they watch for any kind of crime, and children weave through crowds without a care in the world. Our adventurers find themselves in a popular tavern, The Red Goose. Though on this day it isn't as popular as usual. Most of the wanderers, adventurers or daily patrons are already out on missions or possibly still asleep from the night they had before. Many tables are open, though the bar is full and the male Half-Orc Bartender, Ogugbu, behind the counter is still constantly working on people's drinks and food. Jakkar "Jak" Heart-Throb As the town started to come to life, the small closet-like room that Jak decided to rent wasn't the best at keeping the noise out. He groaned as he stretched on his small bed on the floor which consisted of mostly straw and thin blankets. Mornings weren't his thing and waking up was the worst, unless he was having one of his nightmares. Then waking up was a blessing. His time in the army, trying to heal those who couldn't be healed was the worst. His nightmares made them even harder to heal than the real life twist they came from. He sat up and dressed for the day. His leather armor fit him like it was tailored to him, which is was. Other than donning the human army colors, these were the same clothes he wore. Instead of medic gear, he now donned his musical instruments. Though he still had his long sword on his hip. Sometimes physical fighting was the only way to do things, plus when it came to his music magic, he preferred the helpful side of his spells. His lute had a strap to secure it across his chest so it hung on his back over his small backpack. Jakkar made his way downstairs to the Tavern. The Red Goose was a home away from home for Jak. He often traveled around the Dwarven kingdom. It was so different from the human one and he liked it. Plus the booze was better as were the people. Even though he was part Fiend, the Dwarves didn't care as much as the humans did. Especially when Jak made it a priority to help anyone who asked. He made his way up to the bar and waited for the Half-Orc to notice him. As much as he wanted his morning ale, he was patient. "Morning, Hammer-Fist." Jak smiled brightly to the male behind the counter. It wasn't his real name, but a nickname that Jak had given him. Ogugbu wasn't a name that Jak was comfortable saying and it was a name he didn't particularly remember either. At least Ogugbu didn't mind being called something like Hammer-Fist. "The usual?" Jak nodded and looked around the tavern as he waited for his mug of ale. Xandrie Wildfoot Xandrie was rudely awoken by a high elf nudging her with his boot. She had fallen asleep with her fox, Rusco, on the outskirts of town near the wall that surrounded them. "Oi, Kid! You can't sleep here. Where are y-" Before the man could finish asking where her parents were, she swiftly knocked him on his back with a kick to the back of his knees. She was standing over him with her finger in his face. "Don't ya' know it's rude to kick people?" Her accent came from the version of elvish she learned growing up. "I am not a kid, you old fart." She picked up her backpack and staff that were leaning against the wall. It was luck that they weren't stolen in the part of town she was in. Maybe her looks of being a kid kept people away because they didn't want to steal from a child. Leaving the man still on the ground, she clicked her tongue to signal to Rusco to follow her. She shook her coin purse and listened to the few coins rattling inside. "Looks like eh small breakfast today, Rus." 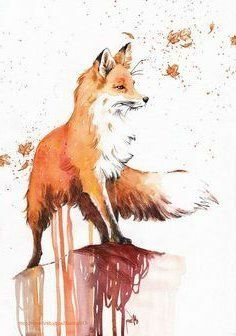 Xandrie said to her fox as she led them towards a tavern. The Red Goose was known for it's cheap and delicious meats as well as their mead. She guessed she'd have enough for a meaty breakfast, but would have to hunt later if she didn't find work. Rusco ran ahead and went around the tavern, probably to find scraps people threw out. Xandrie entered and immediately started to salivate at the smell of boar. She noticed that the tables were almost all empty, everyone there was up at the bar either standing or sitting on one of the few stools. She took out her coins and walked to the side of the bar which was almost as tall as she was. Standing at 5 foot even, the bar was probably 4 feet tall, so just her head showed above it. Not a very short person accommodating bar. "I'll take some boar." She said as she laid out her coins for the bartender to see. He grunted as he nodded and disappeared into the back. Xandrie used this time to discreetly scan the place. The Half-Orc returned with a nice plate of meat and took 3 of her 5 coins. She bowed her head in thanks and then found a table in the middle of the room. Genevieve lives for the hustle and bustle of a weekend morning crowd. She doesn't mind rising early to join in the masses as they head into the market. Even in a dwarven village, the brunette has no problem blending with the crowd. She's slightly taller than the majority of those wandering about the streets, but other visitors tower above her. As far as she can tell, no one notices as her hand slips into a pocket, or two, taking a trinket or a few coins. Genevieve spends the early part of her morning in this manner, and by the time the sun has risen above the horizon, the rogue has worked up quite an appetite. With a skip in her step, the rogue heads to the Red Goose. A kid is entering in front of her, and Genevieve slips in behind the blonde just before the door closes. After a moment's hesitation, as she debates where she'd like to sit, Genevieve decides on an empty portion of the bar, flagging down the half-orc as soon as she recognizes he's available. There's a small, internal, debate before she ultimately decides against ordering in Orcish. "Beef stew," the rogue requests, face beaming, once she has Ogugbu's attention. Once her order placed, only then does she bother to scan the room and take in the other patrons. In the back corner, she recognizes Narvith, nursing a drink. She doesn't acknowledge the half-orc, and he dutifully ignores her. The half-orc spends most of his days in taverns when he's not tagging along with Genevieve. Unlike the rogue, he's not quite an early riser and prefers to sleep in most mornings. This particular morning, he'd done just that — the night before he'd rented a room at the Red Goose. The room was hardly designed for a man of his size, so it didn't provide the most comfortable quarters. But it beat sleeping outside, yet again. When he finally did wake up, he'd dragged himself downstairs. "Ale," he'd practically demanded of the barkeep. He exchanged coin for a drink, then took up a seat in the far corner, trying to remain as inconspicuous as a half-orc can in a tiny, dwarven village. He's hardly begun nursing his drink when Genevieve whirls into the room. She sets herself up at the bar, ordering before scanning the room. He shakes her head at her. She should know better. The rogue doesn't give him any acknowledgment. He takes his cue from her, pretending not to know her as well. He never questions it (well, not anymore) when she does this. The first time it had happened, he'd taken great offense. He didn't realize she'd decided on working a con and didn't want anyone knowing that she had over six feet of muscle backing her up. It's been a few years since then; his trust in the tiny girl is unwavering. Now, he follows her lead without a second thought. Jakkar "Jak" Heart-Throb Jak's usual was a mug of ale accompanied by a plate of ham and eggs. It was up quickly. He placed the coins down for Ogugbu, who grunted his thanks before going onto the next task. Ravenous, it didn't take long for Jak to scarf down the food in front of him. He took his time with his ale though, never knowing when he'd need his wits. Being a teifling did make his tolerance a bit higher than average, but he didn't like to risk it. Even though he was helpful, there were always people who had some kind of prejudice against teiflings. His eyes wandered over to a young human woman sitting at the bar. She was very pretty, just the type that Jak liked to talk to. He just hoped her beauty came with a brain. It did get very dull and boring when his charms and good looks made women swoon over him too quickly. A little challenge every now and then was what he always was on the hunt for. He made his way over to the human rogue and used his best crooked grin. "Hello, I'm Jak. I just had to come over and say. Your dad must be a rogue, cause he stole the stars and hid them in your eyes." It was one of his more cheesy pick up lines and he happened to use it not knowing that she was a rogue herself. Xandrie Wildfoot Xandrie ate her food quietly and quickly. She didn't like being indoors for long, but she also didn't want to look like a crazed wild child by eating outside. When she was sure no one was looking, she did slide a couple pieces of meat into her bag for her fox. The boar was cooked perfectly and as she wasn't used to seasonings, she was glad this batch didn't have much. She listened intently all around her, making sure no one was sneaking up on her or just approaching her normally. When she finished, she took her plate up to the end of the bar so the Half-Orc didn't have to clear the one spot at the table she was at. Then she went to the bathroom before the Tiefling approached the human woman. She cleaned herself up, not realizing how dirty she was getting to be. Bathing in the river only did so much without soap or a brush. Then slipping through the forests was never easy if you were worried about dirt and muck. She pulled her long blonde hair out of it's string to make it look a little nicer in the big partial bun, partial ponytail she normally wore. After she relieved herself, she made her way back into the bar. She was about to head back outside when a Dwarven guard was walking through the tavern. His stout form moved around the tables with ease as he walked up to the bar. "Oi, Ogugbu. I got a new task for anyone who's looking for work." He was on the side near Jak and Genevieve. His eyes shifted over to the two. "Hey, you two look like adventurers. You looking for work?" The guard looked at them hopeful, obviously wanting whatever task he had to be done with quickly. "I am." Xandrie said as she approached the three. The guard looked her up and down, his eyes narrowing at what he saw. "It's a job that will require more than one person. Do you have any friends?" She was relieved that he hadn't said anything about her looking too young to be anything. Attacking a city guard wouldn't be the best thing. Her face saddened as she gave away that she wasn't running with a group, but had wanted that job. Now she had to keep searching for something to do. The barkeep placed a bowl of steaming stew in front of her and Genevieve inhaled deep. It smelled delicious. While observing the crowd, she'd picked a few people that would make for easy targets, and she was going over her plan in her head when the tiefling approached. At his cheesy line, Gen turned and arched a brow at the male. "Tell me," she said, conversationally. "Has that line ever worked for you?" It was clever, she supposed, but it sounded like he was hardly trying, going through the motions. Her attention was pulled from the conversation by the mention of work. Ears perking up, she leaned over to tell the dwarf that she'd be interested when he addressed them. Glancing down at her wardrobe, she supposed she did look a bit like an adventurer. The blonde girl from earlier interrupted and Gen frowned. "I'm interested," she put in, finally, noticing the girl's disappointment that she didn't quite qualify for the job. Not that Genevieve fared much better, but she did have at least one friend. 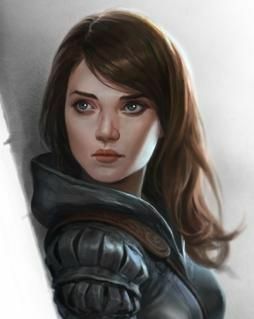 Abandoning the idea of conning any of the people within the tavern, she waved Narvith over. As usual, Narvith watched Genevieve. His hand tensed when the tiefling approached, but it appeared to be a harmless conversation. He was watching, then, when Genevieve waved him over. Standing, he finished his drink and plodded over. He grunted at Genevieve, and she gestured to a dwarf dressed as a guard. "This man," she said, smiling bright, "might have a job for us, old friend." Narvith grunted again. Let them think he was stupid. "So," Genevieve continued. "That's me and a friend..." she looked expectantly at the guard. Jakkar "Jak" Heart-Throb Jak was about to answer if that line had ever worked for him with 'Once...' but was interrupted when her attention went to the Dwarf Guard offering work. He listened as the two girls said they'd be interested in the job and then watched as Narvith walked over to join the girl he was just talking to. 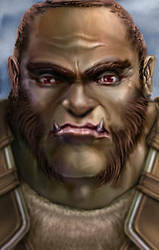 The Half-Orc didn't say anything, merely grunted which sounded like he agreed with Genevieve. The Tiefling stood up, a feeble attempt to seem dominant, and with a smile looked at the four in front of him. "All of us will go. Would four be enough for the job?" His smile turned into a grin when the Dwarf nodded. He hoped the other three wouldn't object. It was always interesting when a random group formed. The last one he was in didn't end so well, but he was up for trying again. "Well if you four are up for it. We need a warehouse cleared down in the industry district. Don't know what's in there, but it's been abandoned for quite some time. Try not to tear down the whole place is all we ask." He held out a piece of paper to Genevieve. It held the address of the warehouse and where to go when done with the job, also that they would receive 100 gold for completion. "Good luck. See you later." With that, he left the bar in a hurry. Xandrie Wildfoot Xandrie's eyes perked back up again when the Tiefling man said they would all do it. Even though she would have to work with others, she figured it could be faster and pay higher than taking a smaller job. She kept silent as she watched Jak tell the man they would do it and the Dwarf gave a short explanation before heading off to whatever he had to do next. The druid looked at the three in front of her with hopeful eyes. "Oh please let me help. I could use the money and I'm pretty useful in a fight." Xandrie pleaded as she held out her hand to show off her magic. A small flame hovered and danced in her hand. "I may look small, but I'm a lot stronger than it seems." It was true. She was pretty good with her staff and her Yklwa, which was like a dagger version of a spear. Her fox wasn't much of a fighter, but could help too if needed, which was rare. She raised a brow as the tiefling injected himself into her job. The dwarf seemed happy, though, so she supposed she shouldn't complain. At least it meant that she would be hired for the job. Still, she was wary about working with two strangers. An apparent flirt and a child intent on proving herself. "Cleared of--" she started to ask the guard what exactly the warehouse was full of, but he was already on his way having assigned them their mission leaving nothing but a slip of paper behind. 100 gold wasn't bad at all, now the question was: 100 gold each, or 100 gold for the group? She supposed that would be hashed out later. Letting out a breath, Genevieve turned to her two new companions. "You can call me Gen," she introduced herself, shaking first the hand of the tiefling, then the girl. She wasn't particularly looking forward to having a child tagging along, feeling more like a babysitter than anything else, but she didn't have much of a choice in the matter, and just because she was young didn't mean she wouldn't be useful. "Just don't screw up," she answered the girl, eyeing her carefully. The half-orc didn't work well with others, but Genevieve was on board, so he wasn't about to voice any complaints. "This is Narvith," Gen was saying, jerking his thumb in his direction. He peered down at the other two, grunting in acknowledgment. He didn't offer to shake hands with either of them as Gen had, but he did give a half smile. In all honesty, the grin was probably not all that comforting since it showed more teeth than most would want to see of a half-orc, but it was intended to be a friendly gesture. "Do you intend on speaking at all this trip, or are we pretending you don't speak much common?" Genevieve had turned to him, grunting in well-pronounced Orcish. He shrugged in response. He hadn't really decided, yet. He didn't know these people, and he wasn't sure if they were going to be around long enough to get to know them and, ultimately, decide to trust them. As such, he was content with letting them make whatever assumptions about his person that they wanted. For now. With a bright smile on her expression, the rogue turned back to their two new friends. "Should we go take a look at what they were dealing with?"